The Fashion Guide Blog : Rule # 24: How to wear a jumpsuit. The jumpsuit trend has a great history, it hasn't been created lately. Just a new and modern approach has been added to it. Thereby, the jumpsuit style is complied with new fashionable elements. It was fashionable during the ancient times. Women who introduced the fashion were provided with jumpsuits in 1919. The spring/summer 2013 fashion trends bring back the stylish and elegant outfit. The jumpsuit trend comes in all styles, colours, prints and materials. Just like that, it's suitable to wear both during the day and night. You can put it on while going to work or to the beach. You can rely on the jumpsuit on any occasion. If you have never dared to wear jumpsuits before because of your personal reasons but you have just made up your mind to experiment and look hot, this summer 2013 gives you this splendid opportunity. At ease lines, stainless cut, delicate draping. Extra sized shoulders, low-cut neckline, trousers in a crop form. Light materials, very large legs, prints. Pockets, indivisible belts, solid colours. It is up to you to decide whether to choose solid colors or prints. It depends on your taste, on your appreciation of beauty, on your body silhouette and also on the event. If you are prone to a classy style, choose a solid colour which can be both neutral and bright, and make your look shimmering by wearing a pair of stylish shoes. Otherwise, you can choose a frisky print. There are jumpsuits for different occasions: sporty, frisky or up-to-date jumpsuits and overalls. For a sporty look you had better choose relaxed and easygoing body silhouettes. For a frisky appearance amusing prints are more recommendable. For an up-to-date look you can choose rich and florid materials, classic colours and womanish body silhouettes. We should consider one important fact that we cannot wear each outfit at work. Fortunately, this problem doesn’t concern the jumpsuit trend. If you plan to wear jumpsuits while going to work then you had better choose pure and minimum lines in infallible smart silhouettes, which can be in solid colours and in graceful prints. 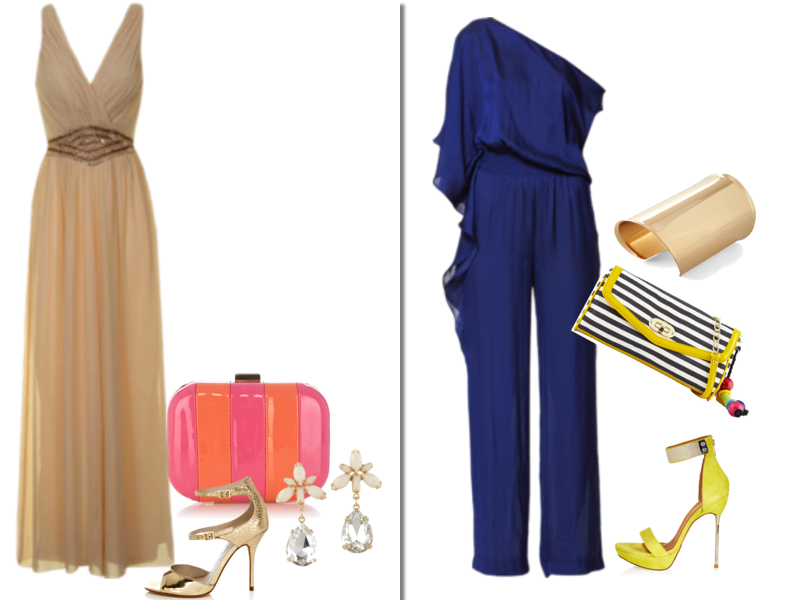 You can pair the jumpsuit with accessories, light makeup and simple hairstyle. You don’t have to spend much time on deciding what to wear while going shopping or for a walk. Jumpsuit trend is a great help for you. Just put it on with little accessories, under a jacket, with high heels or wedge heels. It provides you with a careless and easy look. Jumpsuits came to be a perfect substitute for a fascinating dressing gown. Tips: elegant materials, soft details, womanish accessories and purified hue tones. While going for a party you always can choose a little black dress but if you want to follow summer 2013 trends, then wear a black jumpsuit as an alternative to a little black dress. You can show off some of your body parts by delicate cuts, or just open your back. Long sleeves give you a graceful look. You will get a perfect finish by wearing belts and making your lips red. So, you learnt how and where to wear jumpsuits. Let’s experiment with this new style! What do you think about my choice? Left: Denim jumpsuit & necklace, Zara. Shopper bag, Mango. Shoes, Topshop. Sunglasses, Oakley. Right: Jumpsuit, Dorothy Perkins. Necklace & bag, Zara. Shoes, Aldo. Left: Jumpsuit, thehut.com. Clutch, oasis-stores.com. Shoes, Karen Millen. Earrings, Aldo. 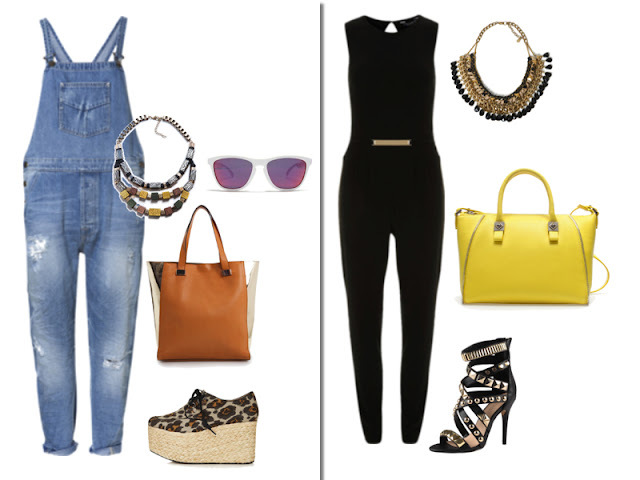 Right: Jumpsuit, Zara. Shoes, Topshop. Clutch, Aldo. Cuff, BCBGMaxazria. And you, are you a jumpsuit fan? Have a great weekend!! Absolutely loving it, but only the shorts version! Geniales tus consejos y muy buenas tus propuestas!!!!! Love this trend and thank you so much for your tips!! I keep this post in my favorites! Rosa, thanks so much for your comment! Glad it will be useful! Enjoy the weekend! Kisses! Me encanta el azul eléctrico de Zara con el hombro descubierto. Lo único es que este tipo de prenda es muy poco práctica porque a la hora de ir al baño tienes que quitarte todo. Buen fin de semana.